Maximum stretch in these three-strand dock lines to absorb shocks. Packaged, premium nylon dock lines from New England Ropes. 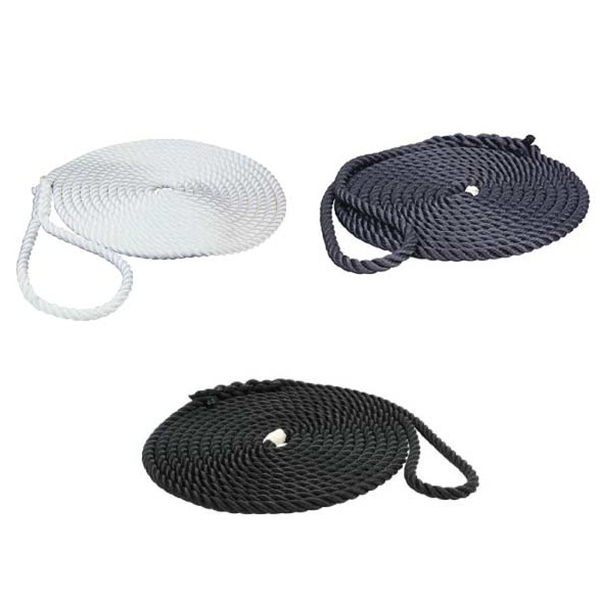 All are made utilizing four-stage balanced construction with heat stabilization for a durable, long-lasting rope. This attention to detail produces a dock line that is easy to handle and will not harden with age. Breaking Strengths are: 3/8" 4,400lb. ; 1/2" 7,500lb. ; 5/8" 11,650lb. ; 3/4" 17,150lb.